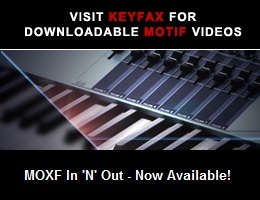 Viewing topic "Motif XS6 USB samples to voice saving"
I have found your forum while researching information to help our band’s keyboard player, who is not very versed using his Motif. I am trying to help. How can I save 4-5 samples that are loaded on a USB thumb drive to a voice (either drum or other) and trigger them with one key each. I succeeded to load the samples to Integrated Sampling with instructions from the forum. Thanks! I can trigger them, but sometimes the basic sound (piano for example) is still under the sample. I just cannot save to voice. We installed (probably for nothing) 2 DIMM cards. I would probably like to do an AUTOLOAD on power-up. For your purposes, placing the samples in a Drum Kit is appropriate. If you have specific questions afterward, just ask. Since SDRAM (DIMM) memory is volatile, you’ll indeed need to reload the samples at each power-up, and using Auto Load minimizes the effort. See pages 262-263 of the XS Owner’s Manual (http://download.yamaha.com/file/10074). Thank you very much 5pinDIN. I will follow your recommendations as soon as I get my hands on the Motif keyboard. Your recommendations are highly appreciated.